The doom of African societies is not the thoughtless politicians who siphon the people's fund and mess up the polity; is not the sleeping judiciary who seem to have forgotten their job; is not the nervous law enforcement agents who are scared stiff of losing their job; is not the impoverished masses who struggle and jostle for the falloffs from the bourgeoisie’s table; the doom of African societies is the compromised stomach-driven brown-envelope journalists who, although should be the watchdog of the society, have turned selves into scavenging pigs. 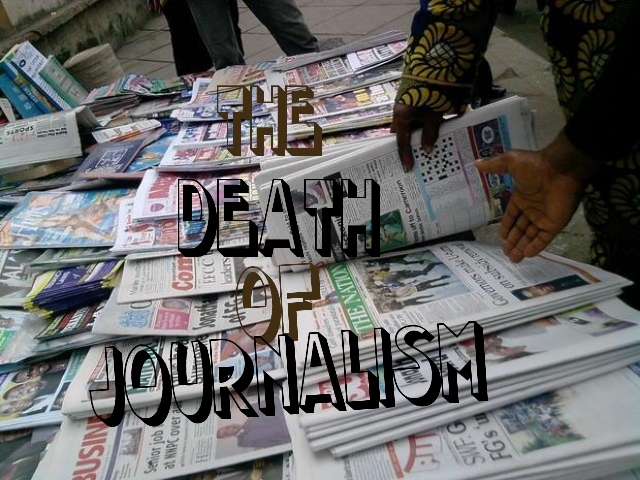 That journalism in Nigeria has died a natural death cannot be disputed. The debate, however, is its time of demise. While some people – the likes of Nnamdi Kanu – hold that journalism in Nigeria died with Dele Giwa, others argue that it lived a few years behind Dele Giwa, bowing out with the return of the charade we mistake for democracy in 1999 when avarice finally supplanted honour. In all, even amongst the drummers of the evil beat, Nigerian media is perceived not just as dead but buried and putrefied. The Sudanese fellow impersonating late President Muhammadu Buhari in Aso Rock, earlier in the year called Nigerian youths lazy. At the time of the statement, many were disenchanted. I was, too, for the present day crop of youths populating the enclave referred to as Nigeria are, arguably, among the most hardworking set of people to have occupied mother earth. Reflecting on a number of issues, however, it soon dawned on me that the impostor wasn’t actually referring to physical laziness as many reasoned; he was, in reality, referring to mental laziness – the collective mental ineptitude of Nigerian youths. This mental laziness, if it had restrained self to the commoner, would have been less injurious to the societal fabric, but like a wildfire, it caught across all walks of life. The press is generally reputed as the societal watchdog. It is the voice of the voiceless, the defender of the helpless, and the menace of corrupt and incompetent leaders. A dysfunctional press is, therefore, a dysfunctional society. Riding on the above premises, an observant eye sheds tears when men of the press become mentally inept. To add moral bankruptcy to that deficiency could persuade one to take the suicide option. Mournfully, both ills have bedeviled the Nigerian press. A Nigerian journalist who is not mentally clogged is morally thin. In some individuals even, the two vices assert selves. Am I unfairly taunting men of the press? Read on. The presidency through Femi Adesina scammed the entirety of Nigerian population, and the media turns a blind eye. First, Adesina – the special adviser on media and publicity to President Muhammadu Buhari – announced on November 9, 2018, that the president is visiting Paris, France, to participate in the first edition of the Paris Peace Forum after which the president will join other world leaders to commemorate the centenary anniversary of the Armistice signed on Nov. 11, 1918 between the Allied Forces and Germany in the forest of Compiegne in France to end the First World War. Later, on November 11, Adesina released fake pictures of Buhari(Jubril) in the midst of other world leaders with the caption, “Buhari, Macron, Putin, Trump mark the end of World War 1.” This was done to create the impression that Buhari was actually present in the centenary event in Paris. To make the lies more colourful, Adesina released photo-shopped pictures of Buhari(Jubril) addressing world leaders at the centenary. The Nigerian media, notably Vanguard, Punch Newspapers, Channels Television and the likes, made selves willing tools in the propagation of these monumental lies. With Nnamdi Kanu and IPOB intelligence at work, evidences soon began to troop in that Buhari(Jubril) was not present at the world event as the presidency made the citizens to believe. First, the official list of the attendees was released, and neither the name “Buhari” nor “Nigeria” appeared. Second, the video footage of French president, Manuel Macron, welcoming dignitaries to the event was also released, and again, Buhari (Jubril) was nowhere to be found. Not even someone of close resemblance was sighted. The supposed pictures of Buhari(Jubril) addressing the world released by Adesina and circulated by the loathsome Nigerian media turned out to be pictures of him taken in an earlier event in Paris in February 2018. The cabals were smart by half, as the difference was clear – the podium Buhari(Jubril) supposedly made speech on in the centenary was glaringly different from the podium Macron, Angel Merkel, Theresa May and the rest of world leaders spoke on. Secondly, the pinup on Buhari(Jubril) differed from the pinup on other leaders present. In a country of functional journalism, the press would have asked, “how come Buhari’s own things differed from the rest?” The podium and pinup used by Buhari were uncovered by IPOB intelligence to be the ones used in the earlier event in February 2018. Obviously, the handlers of Buhari(Jubril) are lying, and as it is always said, people lie for a reason. A critical question then surfaces: Why is the presidency fooling the whole country? What are the cabals hiding? In a civilized world the media would have asked Adesina why he lied to the citizens about the president’s whereabouts; why would he have to scam 180 million people with fake photographs of the president; why would he have to make Nigeria a joke before the world as the claims of him presenting a speech in an event they know he never attended spoke volumes of Nigeria’s irksomeness. But rather than asking probing questions, the Nigerian media chose to look the other way. Did I say look the other way? Hell, no! They chose to help propagate falsehood – a hallmark of a deplorable and irredeemable society. With Nnamdi Kanu and IPOB intelligence warming up the atmosphere with more evidences against the cabal’s claims, the presidency quickly churned out another lie, telling the gullible citizens that Buhari addressed Nigerians in Paris. This falsehood too was laid bare by IPOB and its leader, Mazi Nnamdi Kanu, with pictorial evidences. Adesina and his crew were challenged to release a video clip of the live address. They are yet to come up with any. Among other deceits in the Nigerian enclave today, the importation of Jubril Aminu Al-Sudani – the impostor in Aso Rock – stands tall. The cyberspace is awash with evidences of a double occupying Aso Rock, yet no Nigerian media outfit has thought it necessary to engage self in investigative journalism. Buhari, evidences prove, died on 27th January, 2017, was buried in Saudi Arabia and is now being impersonated by a Sudanese double, Jubril Aminu Al Sudani. Is it even difficult to investigate? Start with the ear, move down to the fingers, then consider the height, and then the eyeballs. Run a check on the flightlog of the presidential jet that flew him to London, and then his corpse to Saudi Arabia for burial. Analyze the Google evidence of African Union observing a minute silence in honour of the deceased Nigerian president, Buhari; Queen Elizabeth’s condolence letter to Nigerian government; Eric Joyce’s tweets, and the likes. And then the threats from some sitting APC governors like Rochas Okorocha of Imo State and Ibikunle Amosun of Ogun state. In the wake of the current crisis gulping APC, governor Rochas Okorocha threatened, “if I say what I know about APC Nigerians will burn down ASo Rock within 24 hours.” His Ogun state counterpart, governor Amosun followed up with “If APC provokes me again I will tell the whole world what we were cooking that got the house burnt.” If journalism isn’t dead in Nigeria, someone would have sat the governors down in front of a screen and asked what is it you know that if revealed would make Nigeria boil. The bunkum about rats chasing the president out of office is yet another poorly packaged deception. If I were a journalist, on getting such ridiculous yarn I would have asked myself, “how possible is that? From which source could rats infiltrate the most essential office in the country? But the media ran away with the story. Conveniently so. Journalism in Nigeria is dead and buried. The stomach-driven folks pretending to be journalists these days are too lazy, too fearful and too deep in corruption to question odds and expose jiggery-pokery, even when they glare at them. The rat yarn was, in reality, advanced to buy time for the locks in Aso Rock which were coded with late President Buhari’s fingerprints to be recoded with Jubril’s. One could go on and on and on. Journalism in Nigeria stinks, and journalism is supposed to be a country’s livewire. Little wonder Nigeria is on a free-fall. As I asserted in the opening paragraph, the doom of African societies is not the thoughtless politicians who siphon the people's fund and mess up the polity; is not the sleeping judiciary who seem to have forgotten their job; is not the nervous law enforcement agents who are scared stiff of losing their job; is not the impoverished masses who struggle and jostle for the falloffs from the bourgeoisie’ table; the doom of African societies is the compromised stomach-driven brown-envelope journalists who, although should be the watchdog of the society, have turned selves into scavenging pigs. My heart bleeds!